La dernière feuille is dated the same day as Les papillons. If that song has an accompaniment more agitated most of Chausson’s songs, then the piano writing of La dernière feuille is more static than usual. The music ideally matches the sparse autumnal imagery of the poem, and the lack of much rhythmic impulse in the accompaniment mirrors the narrator’s fatalistic acceptance of his fate. There are nevertheless numerous touches which subtly illumine the text, the vocal line a type of arioso which never has quite the energy to blossom into melody. (Reynaldo Hahn was to learn much from a song such as this which takes some of Massenet’s effects to new expressive heights.) The juxtaposition of major and minor chords at the beginning of the second strophe is typical of early Chausson (something learned from Schubert perhaps?) and the piano writing in the third strophe—chords dropping from the treble to the bass clef in imitation of falling leaves—also shows a lieder influence. 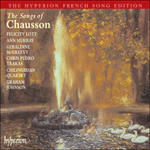 Chausson’s refusal to yield to the obvious temptation to colour the final cadence in the major key (at the line ‘quand l’arbre sera vert’) is typical of his refusal to use musical tricks to manipulate the emotions of his public. A composer like Hahn became much more popular by employing just such ‘obvious’ sensual touches. Nothing but a leaf and bird. Will not allow it to be heard. Love dies, for winter is come. And sing when the tree is green again.